Celebrating its 10 year anniversary, the London Korean Film Festival featured 52 films this year and we’re here to reveal our four favourites from the outstanding line up. Alice in Earnestland, 2015, is a black comedy fairy-tale that explores social satire and experimental direction. It revolves around the character of Soonam, played by Lee Jung-hyun, who is drowning in debt. She married young to a husband who gradually deteriorated until he attempted suicide and wound up stuck in a coma. Soonam is destitute in this cruel, human world and her existence becomes painfully transparent as the world around her crumbles. Directed by Ahn Gooc-jun, this movie is quirky, abstract and altogether exceptional. If you’re a taker for black comedies and you love Korean cinema then this is the one for you. It’s subtly comedic which helps to distance the audience from the pain and suffering and instead, hone them into the wild world of Soonam’s mind. The visuals are beautiful, the direction and narrative are both exquisite and the characters are genius. The dreamy visuals don’t stay kind for long as the narrative turns aggressive and violent we witness an unpredictable balance between pleasure and unease. This avant-garde criticism of social and political stances in South Korea is unmissable. 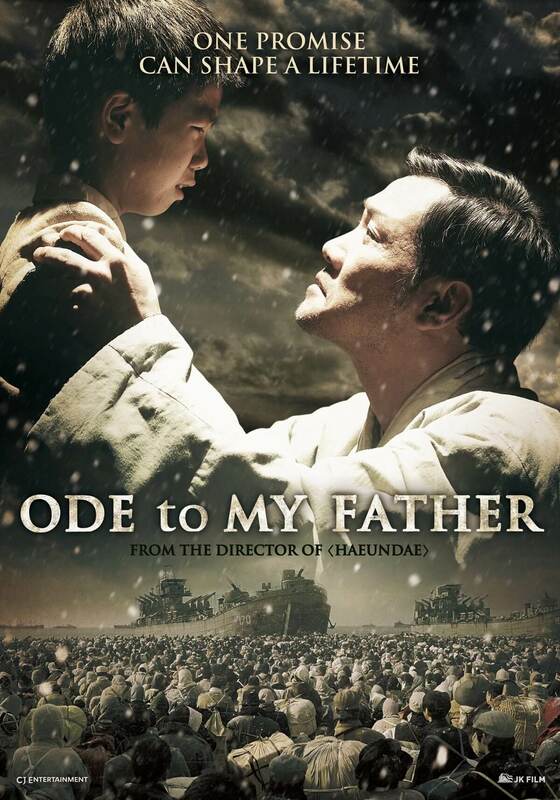 Ode To My Father, 2014, was the opening gala feature at the festival this year and rightly so. This film deserves the critical acclaim it possesses and has become an epic in Korean cinema. Directed by Yoon Je-kyoon, this melodramatic masterpiece surpassed the Hobbit at the box office upon release and has grown to become the second highest grossing film of all time. The film begins with flashbacks from an old man relaying a series of haunting experiences he endured through the decades. It is set in the early 1950s in the wake of the Korean War and follows the story of a family who separated during the Hungnam Evacuation to the south. The daughter of the family disappears and the father decides to stay behind to search for her leaving his child Deok-soo to lead his wife and two younger children to the port city of Busan. The young child, Deok-soo makes a promise to his father to protect and support the family. It’s a promise that spans over sixty years. The raw drama and compelling screenplay clutches at your heartstrings and is reluctant to let go. The vow between the boy and his father is heart-warming, inspirational and real. It’s not a surprise that a lot of fathers and sons went to watch the release at the cinema on Father’s Day. It’s a story that really does stay with you. It is the pinnacle of excellent Korean cinema. The connection between audience and screen is so beautifully constructed as you find yourself relating to a culture and decade you cannot comprehend. It is emotionally draining but also uplifting and absorbing. It may be my favourite Korean movie of all time. 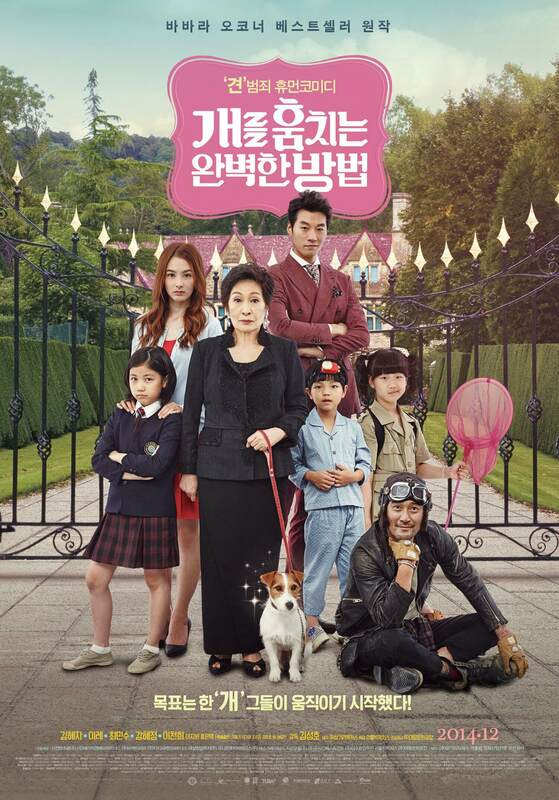 How To Steal A Dog, 2014, is an adaptation on a book by Barbara O’Conner and directed by Kim Sung-ho. It revolves around a family who become bankrupt after their pizza business fails. The father abandons them amid the financial crisis and the mother and two younger children are left living in a van. Ten year old Ji-so dreams of any plan to help her family out of the hopeless situation they’re stuck in and spots a missing dog poster with a hefty reward. Ji-soo believes the five thousand dollar reward is enough to buy a house and seeks the help of her friend to steal a dog of a wealthy owner, pretend to find it and return it to claim their deserved prize money. The naivety and innocence of this movie is enough to make you smile. The narrative is endearing, comical and uplifting. The perfect plan of stealing dogs and reaping the rewards reveals an underlying story of friendship. The narrative is witty, slick and well executed. It’s a heart-warming film that doesn’t pretend to be anything more than it appears to be. 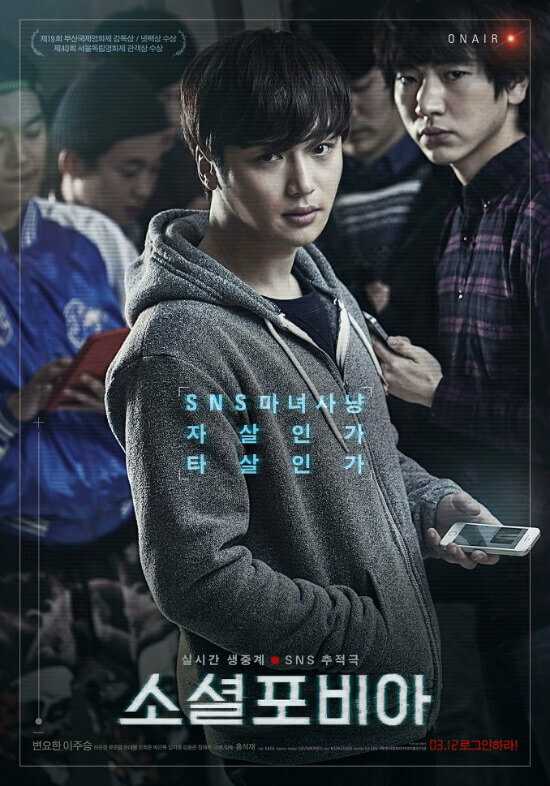 Socialphobia, 2015, takes a look at the extensively cruel world online and the idea of identity behind the screen. A woman becomes public enemy number one as she posts inconsiderate and nasty comments about the death of a soldier online. Her spiteful online presence causes a stir with the public and they uncover her identity. A witch hunt to discredit the woman ensues, but what they uncover is a woman hanged in her home which results in more questions and investigations. Two men training at the police academy, Ji-woong and Yong-min become involved in the investigation. Socialphobia addresses the issues surrounding identity on the internet and how life, as it appears online, is a different story offline. It confronts the dark side of the internet and challenges netizens as a collective. The film personifies the internet as a character itself and that idea is truly harrowing. It’s a suspenseful, mystery film about an “SNS Witch Hunt” with a powerful enigmatic narrative and drive. I’ve never seen a film quite like it and it’s refreshing to see such a dark film that challenges SNS and the World Wide Web. It was difficult to choose from the number of fantastic Korean films showcased at the London Korean Film Festival this year! It’s been a brilliant year for Korean cinema and we can’t wait to see what 2016 has in store!